„L‘Organiste“ is one of César Franck‘s latest compositions – he died while working on this collections and could finish only 59 of the 93 projected pieces. Franck wrote „L‘Organiste“ explicitly for the french orgue-harmonium, although many of the pieces can be performed on the organ as well. Charles Tournemire, who admired César Franck, published a new edition of „L‘Organiste“. He modified especially the registration instructions into the new spirit of his time. These modifications has not been marked in the new edition – but they changed the musical expression of many pieces. The Tournemire edition is the standard and most sold edition until today. 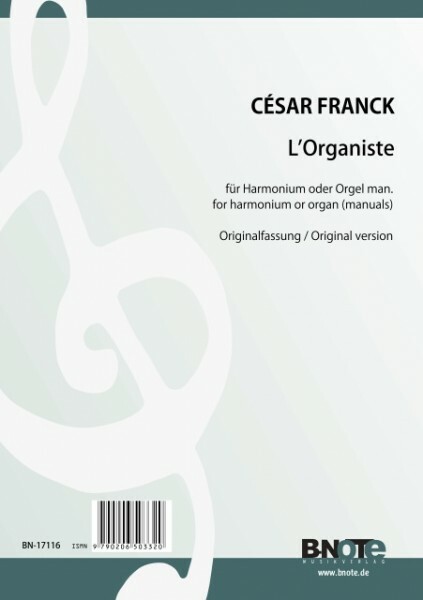 „L‘Organiste 2“ is also available – but this collection has no relation to Franck‘s original work. It has rather been assembled out of several unpublished works posthumously This re-edition of César Franck‘s original version shall bring back the original sound and intention of the composer especially to the harmonium players.